Wow, it's July already! Happy Birthday to my dear mom. Today is also Papertrey's Senior Design Team Challenge. Today it's all about Dawn McVey's Color Couture collection of products. The Color Couture product line is all about pre-printed paper embellishments and/or printing your own papers and fun card templates. They all fit into the nifty Color Couture Binder. 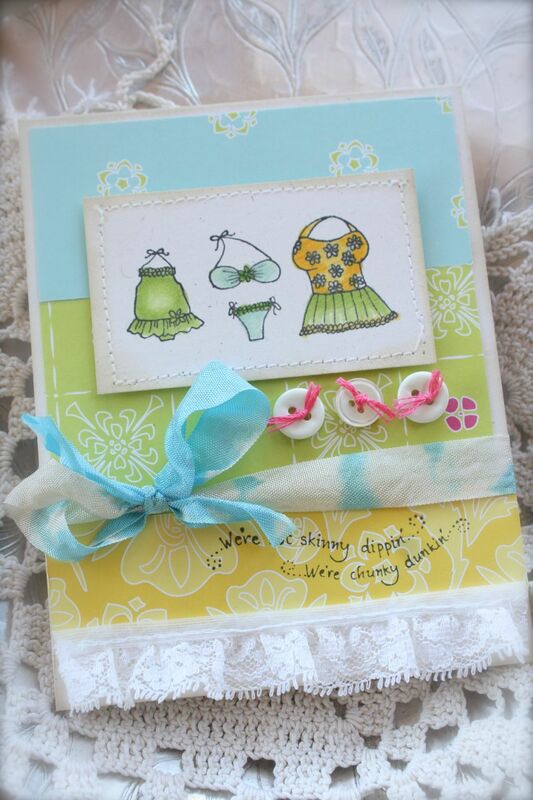 When I think about the Color Couture line of products, I think about fun embellishments and great color combinations. And the best part is that most of the work has been done for you. When you're running short on time or perhaps you just need some instant inspiration, the Color Couture products are great to work with. Today I left the stamps behind and just started cutting up fun embellishments. You can use your paper trimmer and fine tip scissors to make easy work of the pre-printed embellishments. Once I had a few embellishments ready to go, I reached for some colorful Parcel Tags, my handy dandy Papertrey dies and white felt. 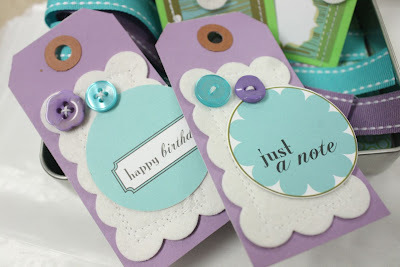 For my purple tags, I cut my white felt with the Fillable Frames #5 die. I stitched the felt frame onto my tag, added some Vintage Buttons and then finished the tags off with punched elements from the Color Couture Volumes 4-6 set. These circles easily fit into my 1-3/4" circle punch. For my green tags, I stitched on more Color Couture elements from the Volumes 4-6 set, and made white felt flowers from the largest flower from the Beautiful Blooms II #3 Die Collection. 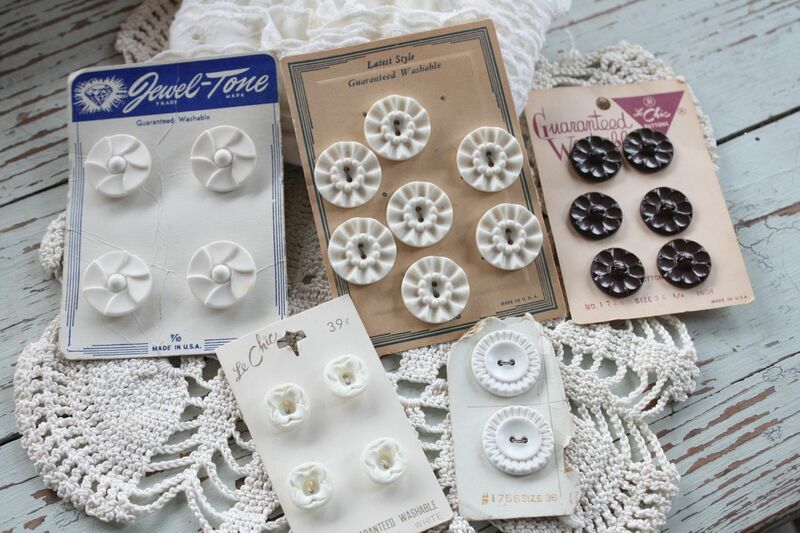 Vintage Buttons finish off the flower centers. 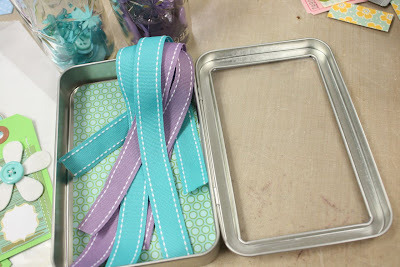 Once my tags were complete I took a Nugget Tin and fit it with patterned paper from the Green Boutique collection. I layered in some Saddle Stitched Ribbon that will go along with each tag. Then I nestled in some tags and stored my tin next to some large glassine bags. 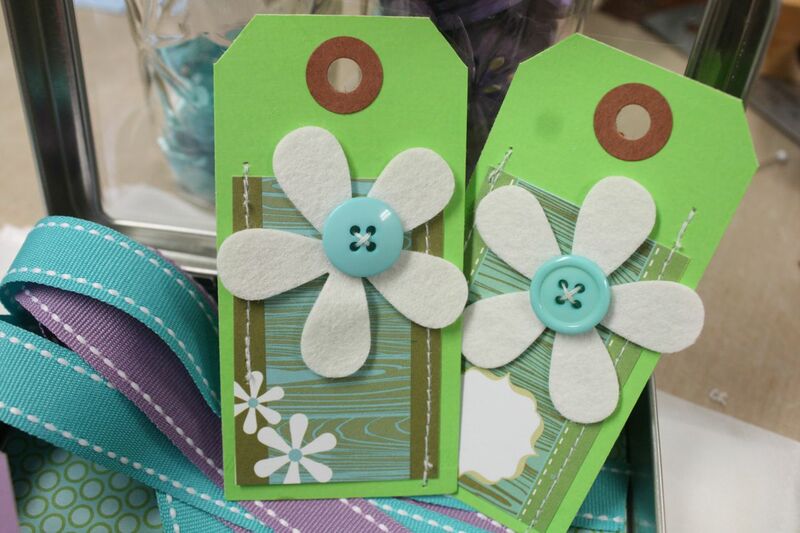 I now have tags and ribbon and sacks ready for instant gift wrap. 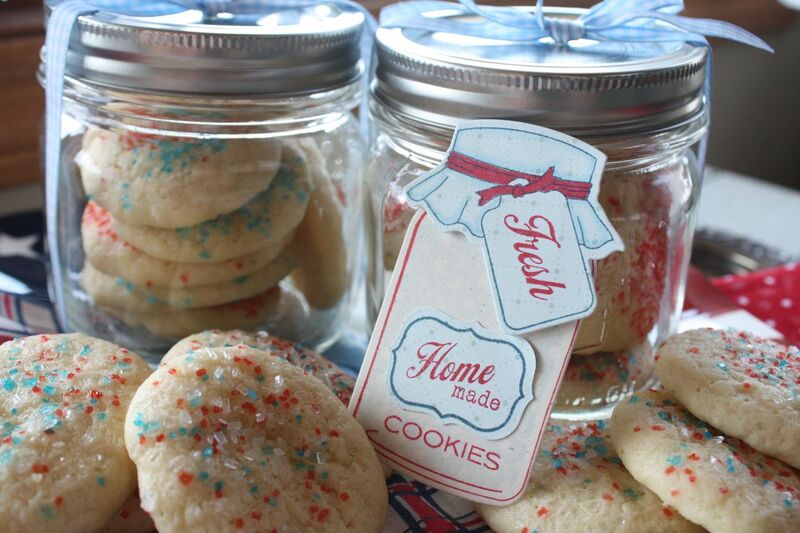 Like for these cookies that sent home with the neighbor. I owed her a check and thought some fresh baked cookies would be even more fantastic for the little favor she did for me while in the city. 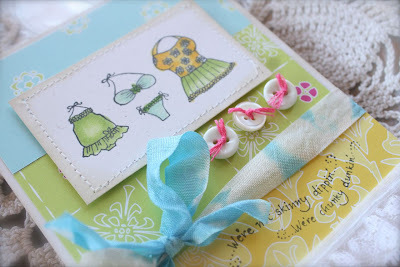 The little tag and gift wrap make everything seem so much more special and thoughtful. Everyone loves a little gift now and then, right? 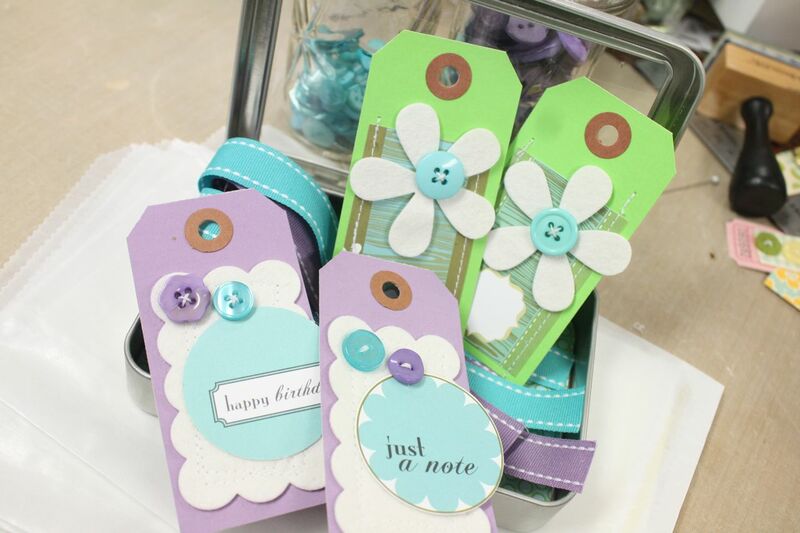 And the Color Couture line of products makes it so easy to create simple, creative, homemade gifty type items in no time. I highly suggest that you take some time this summer to make up a few gift tags with sacks to have on hand. Keep them in a special drawer or in your gift wrap area so you'll know where they are. 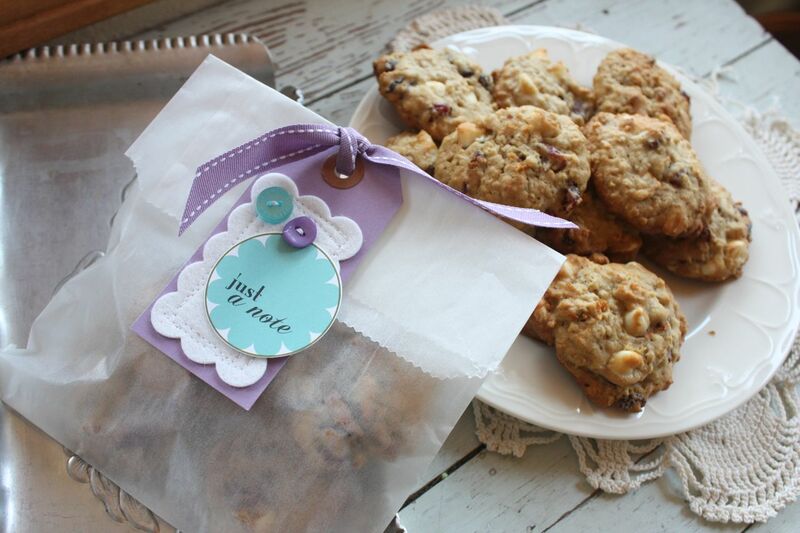 That way, when you do make a batch of homemade cookies or have a few extra hand stamped cards.......and you need a little gift......you'll have just the perfect little gift wrap all ready to go. Enjoy! Hey friends. Today I have lot of shopping to do. It's birthday time for my mom and Josey....plus it's been at least a few days since I've hit the thrifty shops. 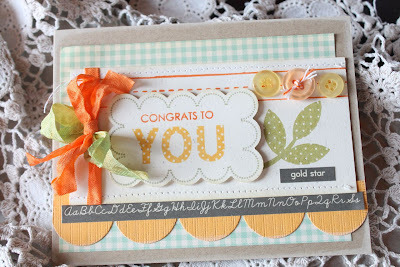 ;) Before I head out for the day I wanted to share a summery card for you. 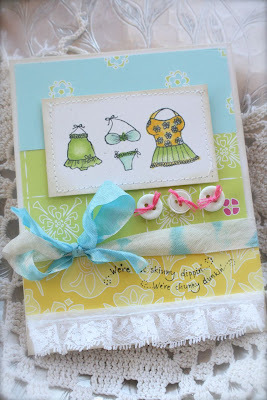 Karen Lockhart has yet another darling, whimsical stamp called 3 Bathing Suits. Perfect for us voluptuous gals. 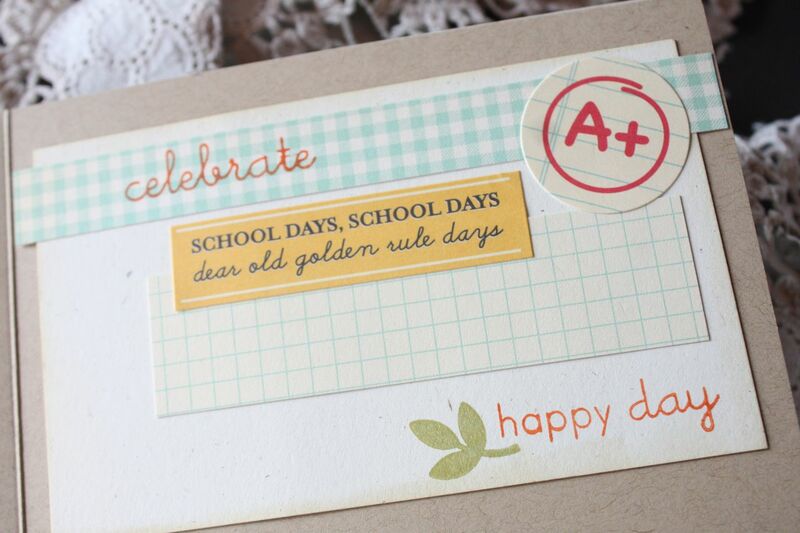 You must purchase the stamp and sentiment both, they just make for the cutest cards. The sentiment is called *We're not skinny dippin'*. You can find both stamps at Ellen's online store. I colored the cute bathing suits with the following Copic Sketch markers: YB03, YG25, BG10, BG11, Y15, Y19 and a Colorless Blender (0) to remove a little color in the lighter areas. 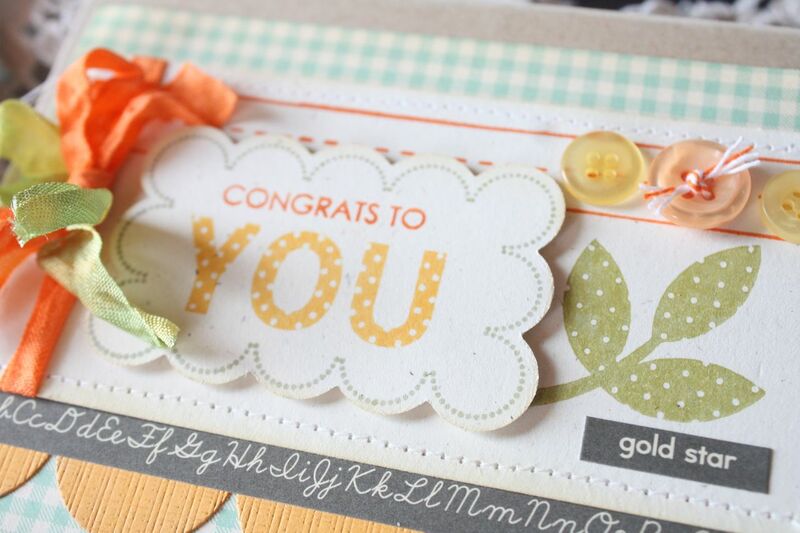 Patterned paper is Delovely from Cosmo Cricket. Wrinkle Ribbon is from my Etsy Shop. I love how it resembles blue skies with clouds. I think these little stamps would be perfect for some summer time notebooks too. Maybe I'll put that on my list next. Have a great day everyone. I've got more photos of my auction finds coming soon so stay tuned! Hey friends. I'm back from sunny Phoenix. My dad and I had a great time visiting relatives. Here I am back in the Artsy Studio. And today I got the most fun little package from Karen Lockhart. Immediately, I had to create something with the pretty little Daisy Apron stamp. Recently I've divided all of my vintage finds by color. So I reached for my pink basket and found some wonderful laces that are used for lingerie, pretty pink buttons, fake pearls, seam binding and more. Be sure to check my Etsy shop soon for some kits that have a wonderful sampling of some of these goodies. 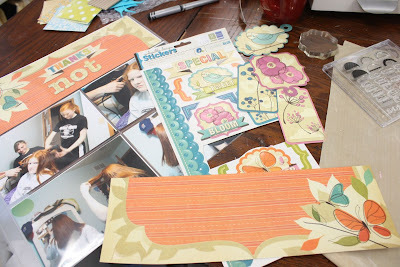 In the meantime, how about a pretty little project? I stamped the apron with Palette Black Noir ink and allowed my images to sit for little while. 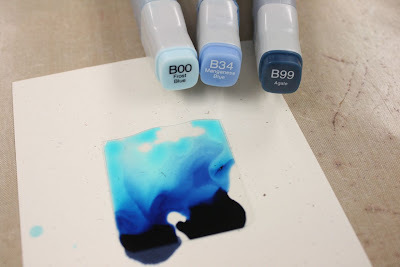 This helps to prevent bleeding with coloring with Copics. I then colored the apron using the colors shown below. I kept the apron all pink, just using various shades to add depth and dimension to the apron folds. The E21 marker was used to outline the apron image and a little bit on the apron hem. Next up, I masked my stamped apron and then used Papertrey background stamps to create a subtle pink and tan background as you can see on the left in the photo below. 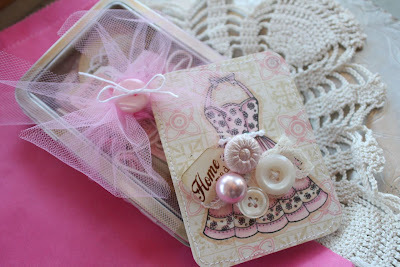 I finished off my card with machine stitching, vintage buttons, ivory lace and a Tiny Tag from my Etsy shop. Such a pretty little, homemade button card that will make a nice finishing touch to a tin full of pink and lacey goodies. 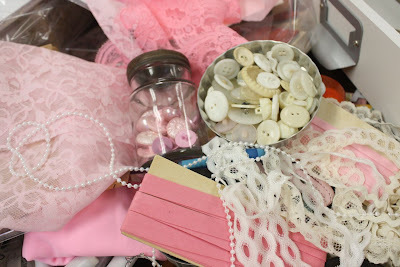 I tied the tin up with pink tulle and a button. All ready to be packaged up in a bright pink sack. 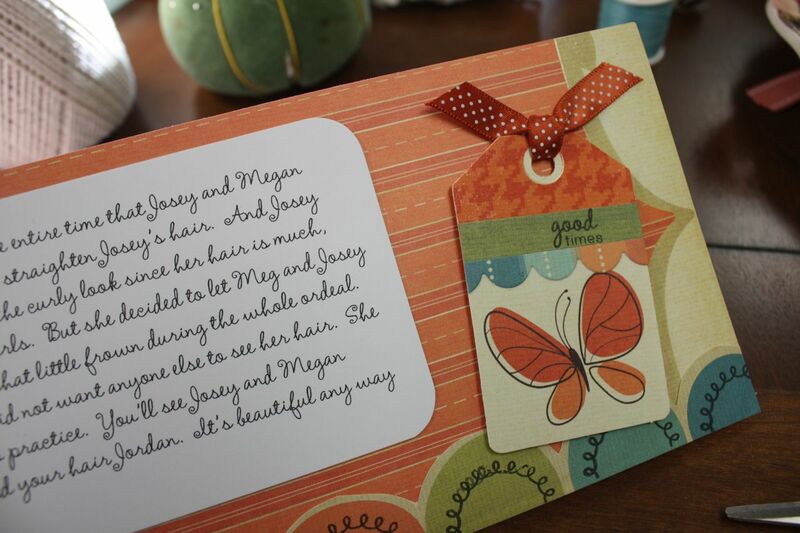 This was one of my favorite projects from Papertrey's June release. I just love the colors and the design and all the fun elements. It was a congratulations card that I sent to my friend Bevie Pearl who worked in the school system. She always tells us girls *Be sure to thank a teacher*. So, so true. I hope she enjoyed her card. Happy Retirement BP! 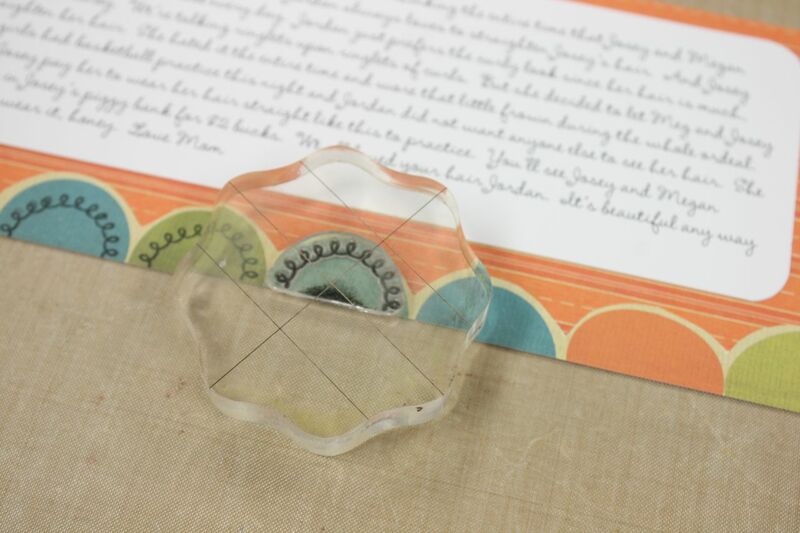 Stamps are Fillable Frames #5 and matching die and All About You. Papers are from October Afternoon. 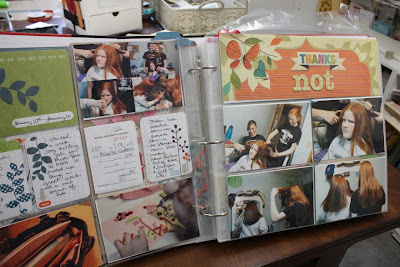 Oh boy, do I love to scrapbook. I don't know why I don't fit it into my paper crafting more. I think it takes on a craft of it's own separate from the card making at times. But when I dig into my photos and scrapbooks, I am one happy camper. Months back, I had enough photos of Josey and her friend straightening Jordan's hair that I needed more than my 365 Daily Album single photo for the day. 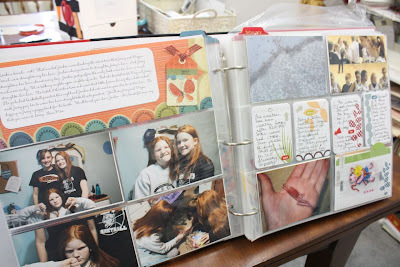 I used some blended scrapbook methods(combining traditional scrapbook with divided page protectors where you just slip in photos) for a quick(er) layout than a full two page traditional layout. I love scrapbooking kits. For this layout I chose a scrapbook pad and some matching embellishments from We R Memory Keepers. 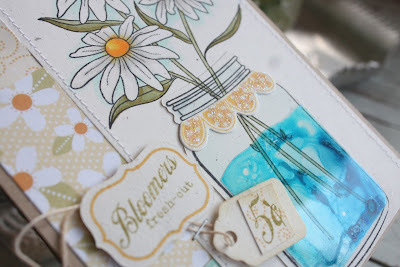 Love these textured tags and borders, etc that go along with it. Makes for easy accents. For the page protectors I chose, I only needed a topper portion since my photos were going into the other slots. I chopped a sheet of 12 x 12 paper down to fit my toppers. The decorations were mostly complete since the paper had a nice pattern to it. I simply added some computer generated journaling and fancied up the patterns with some Papertrey stamps. 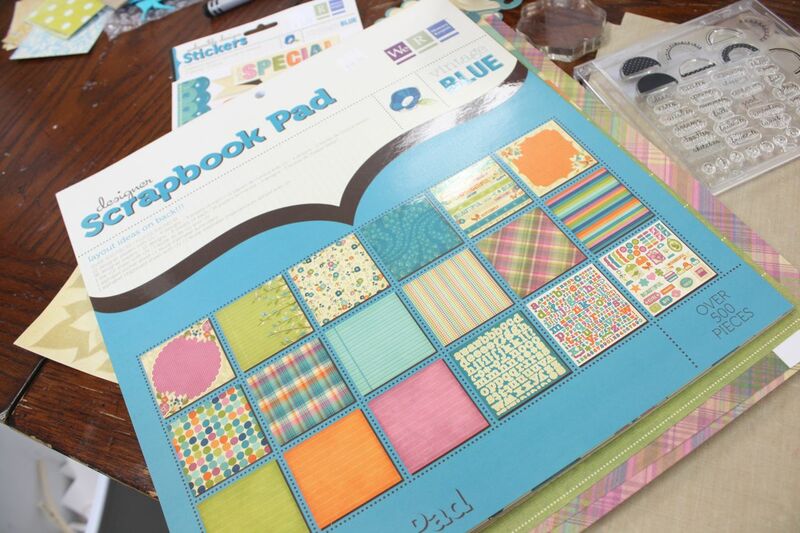 For the loopy half circles, I used Pine's Mini Scrapbook Series: Tabs stamp set. A perfect fit. Next, I took one of the pre-made tags with the butterfly image and added a strip of paper with the *good times* sentiment from the tabs set stamped on it. 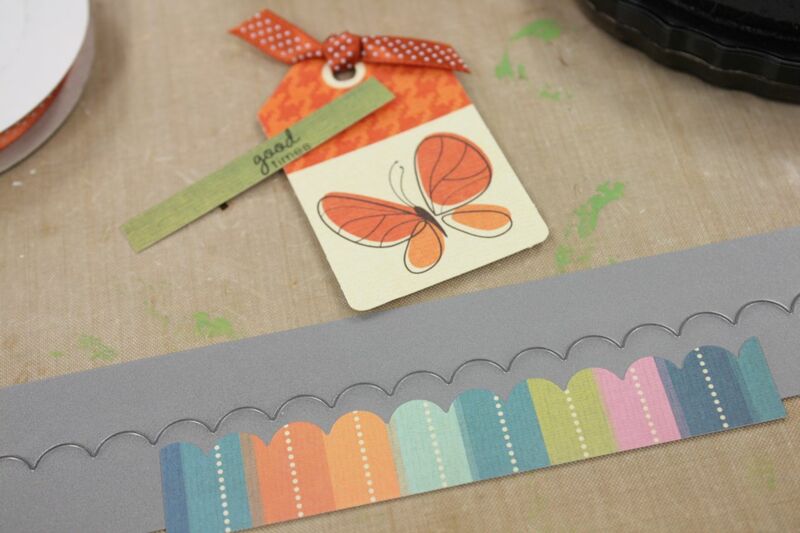 I also added a rainbow striped paper that I die cut with the Small Scalloped Border die. A snippet of Terracotta Tile Bitty Dot Satin Ribbon finished of the tag nicely. A perfect little accent with just a few fancifications. ....and the page on the left is my second page. I added it on the next page because that's how it fit. Sure I'd rather have them side by side, but this is what works layout wise so I just rolled with it. By the way, if you happen to zoom in on the photos, here's the story: Josey and her friend Megan wanted to straighten Jordan's oh so curly hair. She reluctantly let them and it looked adorable. Jordan hated it and made sour puss faces in every photo I took. Good times....great memories. 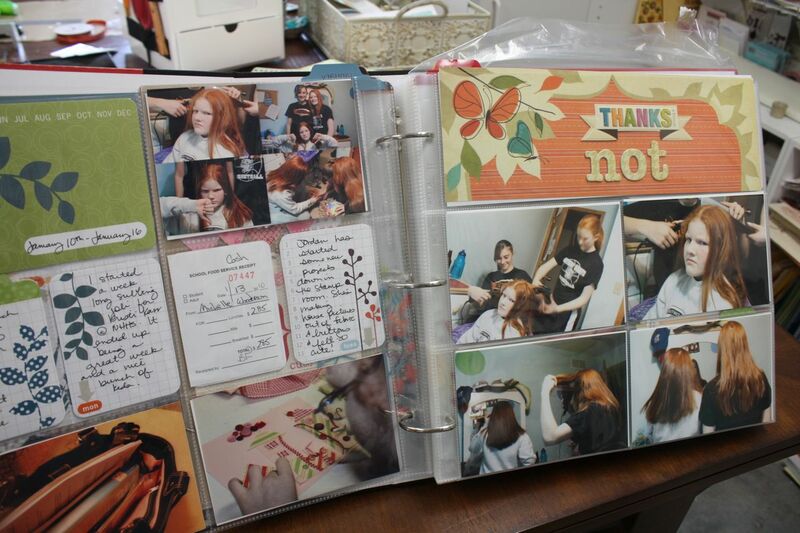 That's why I love the scrapbooking so much. Gotta get some more scrappin' dates on my calendar. Yoohooooo........Carmen???? Edit: About wheelin' and dealin' with the antique shops/thrift shops. I don't ask at the thrift shops because usually the stuff is cheap enough. Antique shops have different booths usually and each owner has different policies. If you find something that is a bit pricey or you find a large item like furniture, the owner will usually take 10% or so off if you ask. I usually phrase it as *Is your price firm on this item? *......not *will you take less?*. It sounds better the other way. You never want to insult an antique person because they always think their stuff should bring more, not less. But as junkers, we always want more for less. It's all part of the thrill for the hunt. Good luck, peeps. Well, the family is all off to World's of Fun and I'm just waiting til it's time for Dad and I to head to the airport. Thought I would share a few of my latest thrift stores finds. 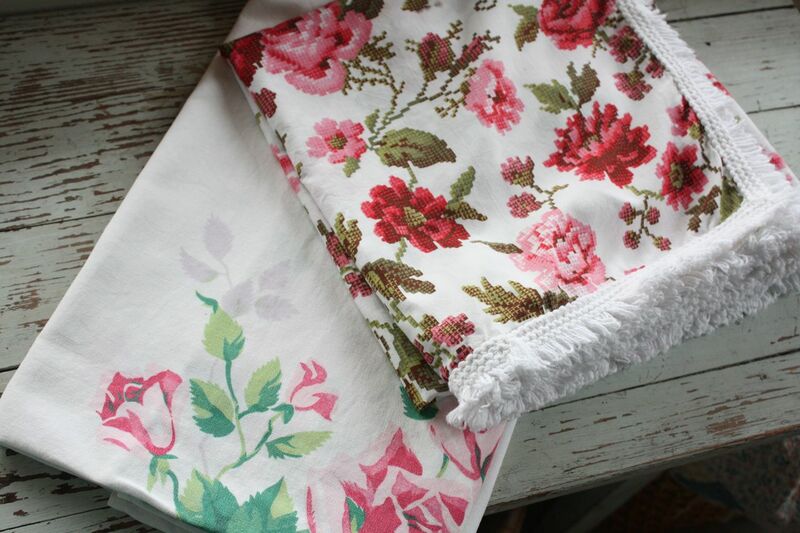 First up are these wonderful tablecloths. I just can't resist them, especially when you find ones that have no stains. 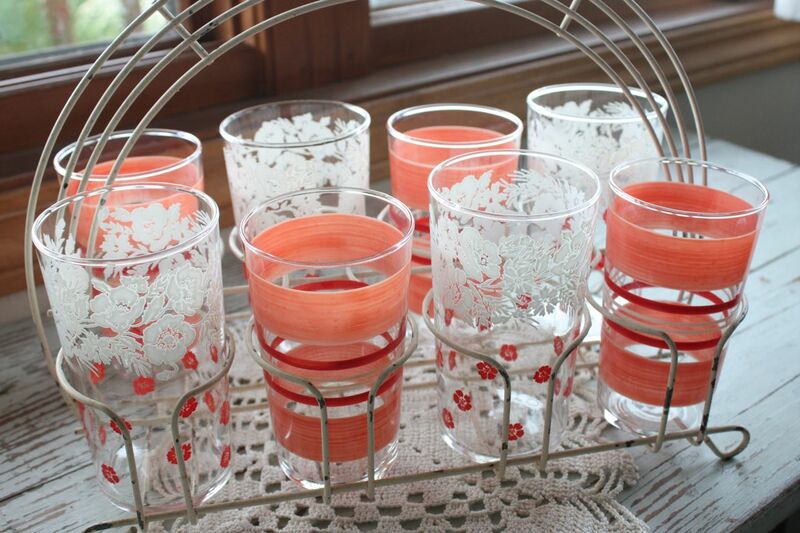 These will look so pretty on my white picnic table. 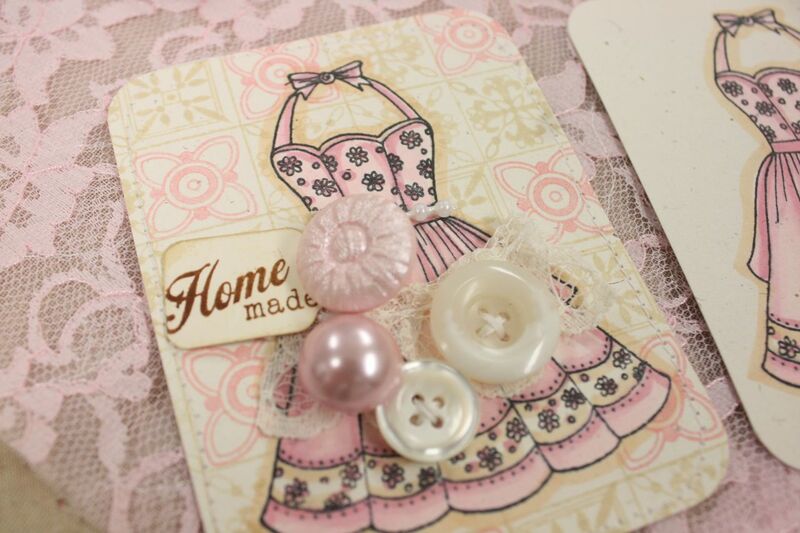 Vintage button cards. Be still my heart. I get wayyy excited when I find these little gems. I am especially fond of these creamy white buttons that are so dimensional. Oh how I love them! I need to get a basket to put my collection in. Pyrex. Tried and true. Totally utilitarian. 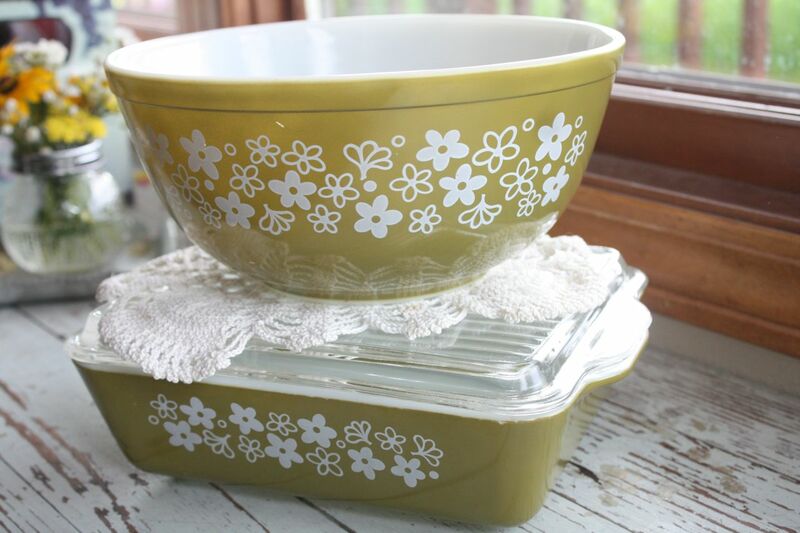 I didn't think I would cave but when I saw this olive green set with the flower garden pattern I could not resist. 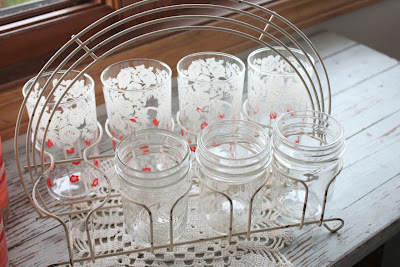 I have noticed at the auctions that Pyrex brings more than the fine dishes these days. The ladies nearly fight over it. 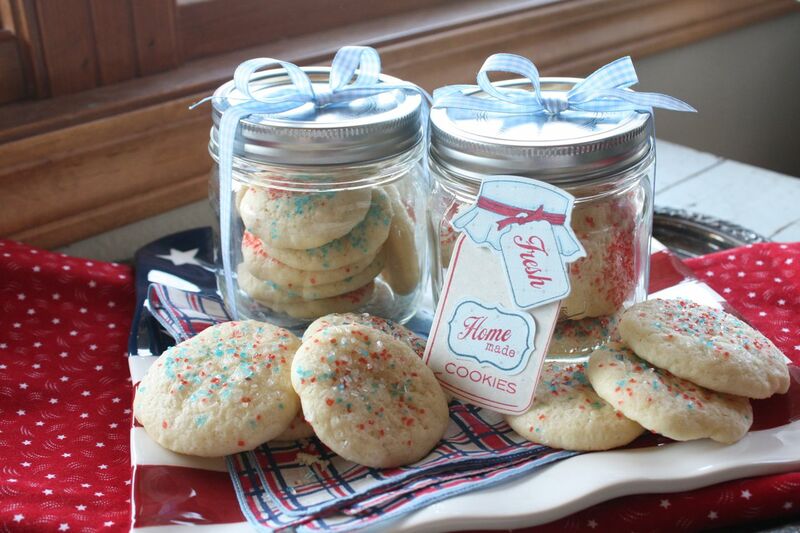 I really think people are using the Pyrex as everyday dishware...not just a pretty dish to sit around. I think I might need more cupboard space. And any type of glass refrigerator dish like the bottom one comes home with me. I cannot resist. And my most unique find was this wire drink holder. Isn't it retro and fun?!! It came with thee seven glasses. 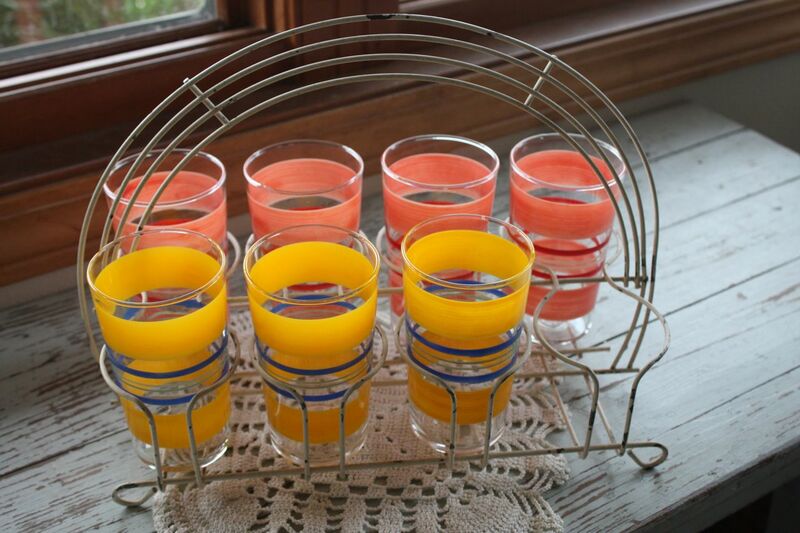 But I also purchased four other glasses that I waited three times to the thrift shop before I bought them. They were still there so Jordan said we needed them. I mixed them in with the other pink glasses.....I love. Just think how fun my cranberry coolers will be in these out on the porch. But wait. You know I can never leave well enough alone. I ran for the pint jars. Yep. Sure enough. They fit in the drink holder. Come to mama. Oh man, this makes my drink holder priceless now. Anything with compartments and dividers usually makes it's way home with me too. Oh, how about delivering homemade jellies in this little carrier. Move over Martha. Ahhh. Such good finds. I dearly love sharing all my goodies with you. Like Forest Gump says, *Ya never know what you're gonna get*......when you go junkin'. Have a great weekend friends! I have some posts ready to go for while I'm gone. Enjoy! Need a fun little gift? 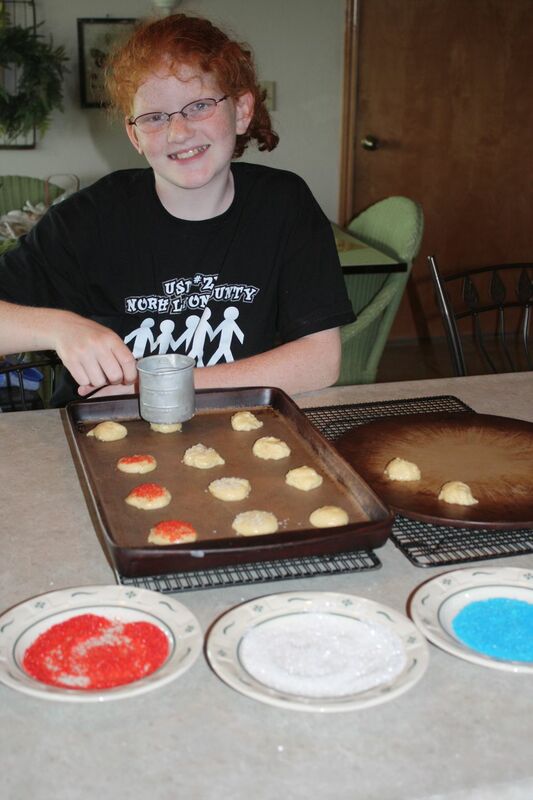 Jordan mixed up some sweet patriotic cookies one day for a fun idea. 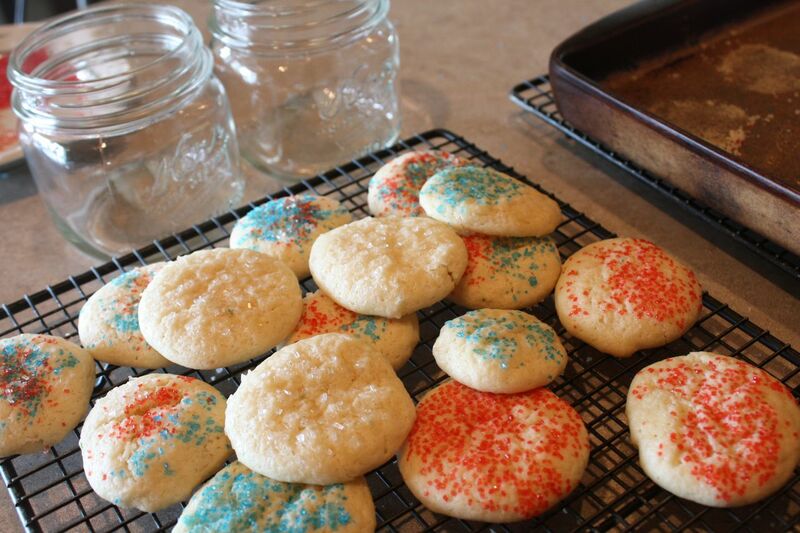 We baked simple sugar cookies and used red, white and blue sprinkles on them. 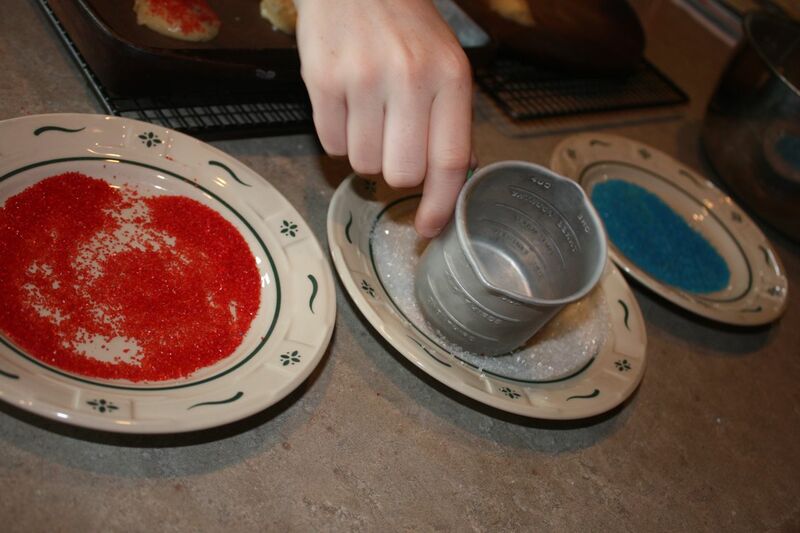 A measuring cup dipped in each color works great. I displayed the jars all on a pretty, patriotic glass tray lined with a vintage hankie sporting red, white and blue plaid. 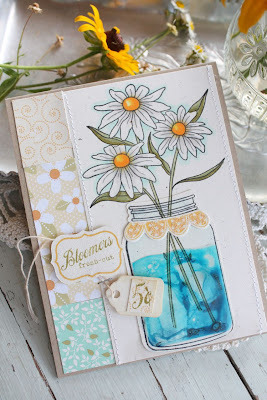 The tag was created very quickly using Friendship Jar and patterned paper from Pretty Pastels. 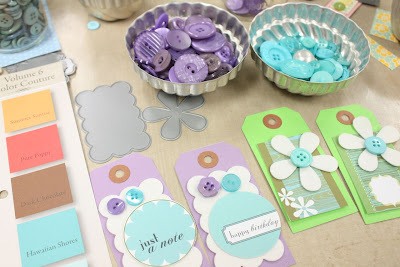 If you get Friendship Jar and/or Friendship Jar Fillers, you must get the coordinating dies. They make easy work of adding fun accessories to your jar. 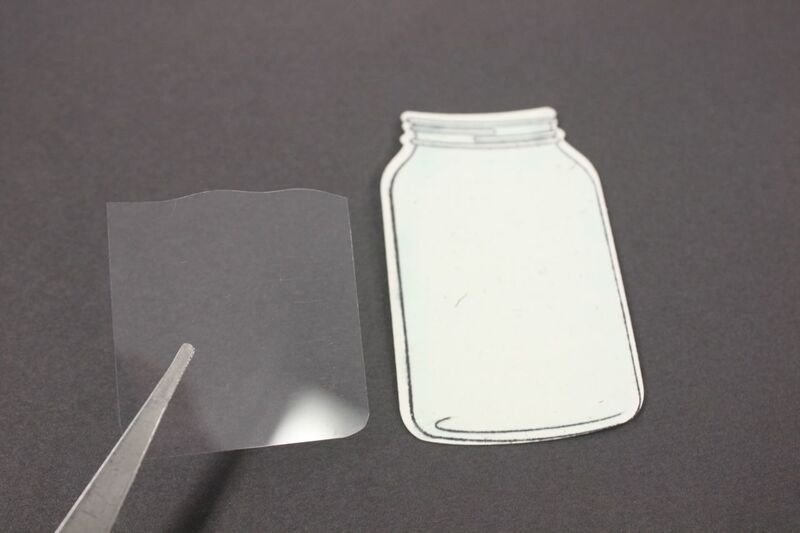 The Jar & Lid, Jar Label and Jar Toppers can be found here. The ribbon is Spring Rain Gingham Ribbon, such a pretty addition to the jars. And for all you vintage lovers, you've gotta be on the look out for an old silver or silver plate tray. 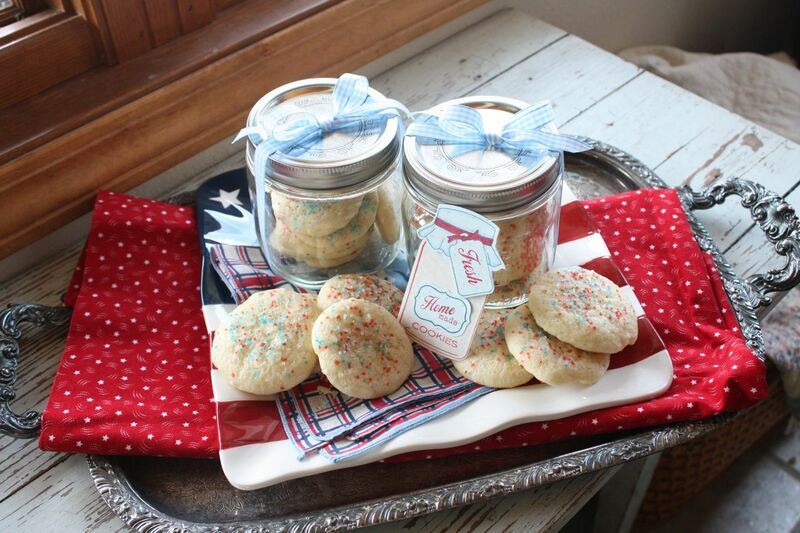 These are nice and heavy and make the best serving trays for carrying goodies back and forth to the porch, etc. I love mine. Well, I'm off to pack for a little trip. My dad and I are flying to Phoenix tomorrow. Please note: Any Etsy orders placed from Friday through Monday will be shipped after I return on Tuesday or Wednesday. Orders placed today will be shipped in the morning. Thanks! Settle in folks. I've got a whopper of a tutorial for you today. I've spent all morning preparing a two part tutorial for you. 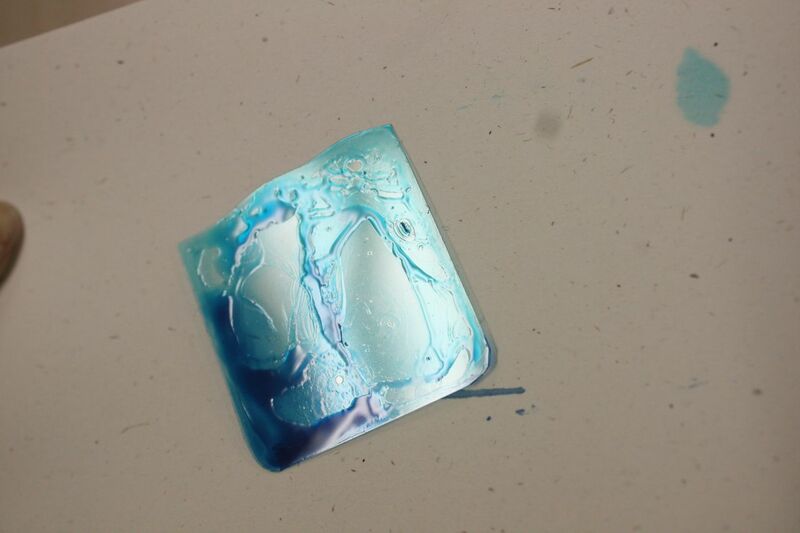 Part one is making realistic looking water for Friendship Jar. 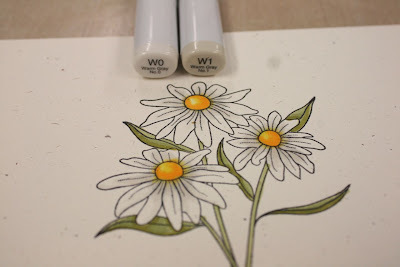 Part two coloring the flowers from Friendship Jar Fillers to look like white daisies. Here we go. 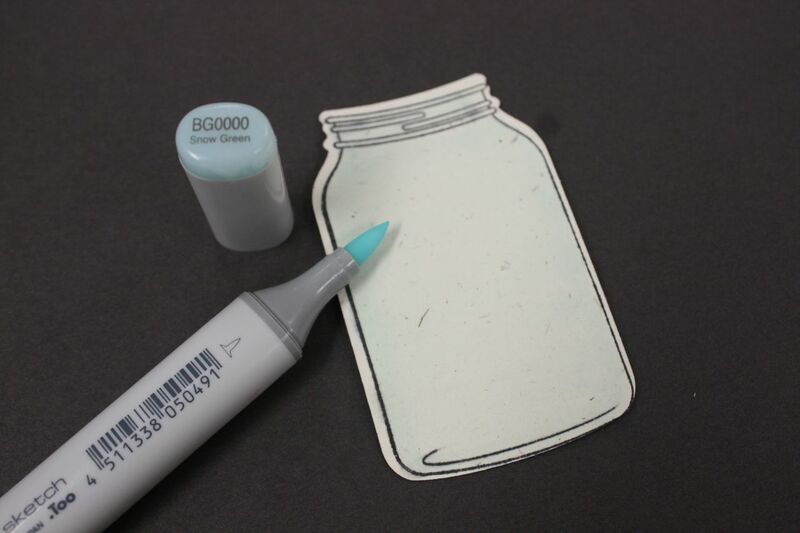 First, die cut the jar and stamp it with the jar stamp. Color around the edges with a Copic BG000 Sketch marker. It's light in the photo but you can still see it in real life. Cut some Clearly Creative Cardstock to fit inside the jar outline. Using scissors, round the bottom corners and cut the top to resemble wavy water. Set the stamped jar image aside for now. To create some fantastic, realistic water I'm going to use the Clearly Creative Cardstock piece I cut along with three colors of Copic Various Ink Refills. 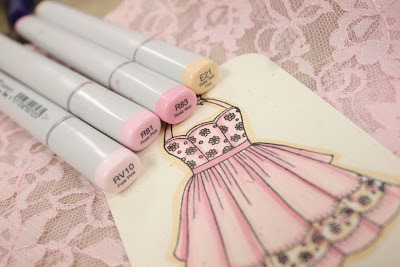 You can find Copic refills at Ellen Hutson's shop. 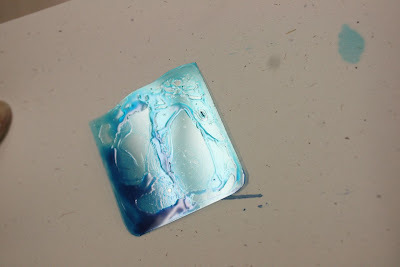 Squeeze drops of the inks onto the clear cardstock. Using a heat tool, move the colors around on the clear cardstock. 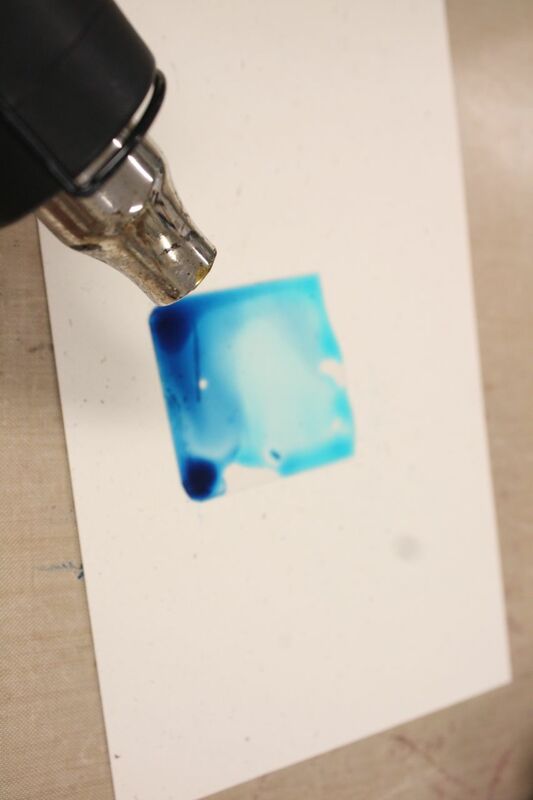 As the ink begins to dry, it will go from looking shiny to a more matte color. Hold the heat gun about 10" from the clear cardstock. If it's not quite the look you want, add another drop or two of the lightest color and blend again with the heat tool. When dry it looks like the photo below. The inky side will be adhered to the card front. The front will be totally shiny, like a real glass jar. So cool! Set this piece aside. 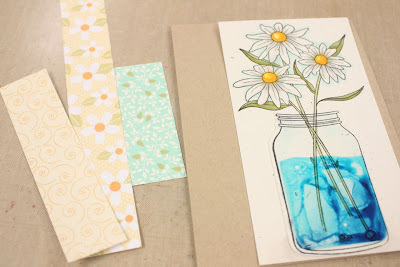 Next, take a piece of Rustic Cream cardstock and lay the stamped jar on top of it. Ink up the flower image and stamp it over the jar and onto the cardstock. You're stamping two pieces of paper at one time. 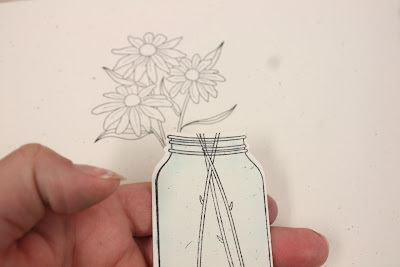 The flowers are on the base paper and the stems are in the jar. Now let's start coloring. 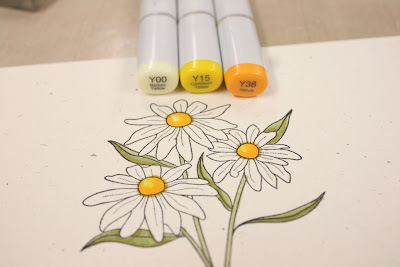 Use the Copic markers shown below to color the flower stems. Us the Y Copic colors below to color the flower centers. If you zoom in, you can see that I have a little ink bleeding going on. That's okay. I'm covering the bleeding up with my grey W Copic markers as shown below. Although the daisies are white, they need a little shading. The lightest of the grey Copics work great for this. 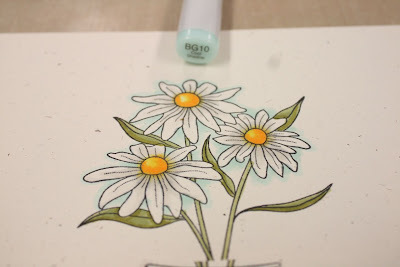 I want my daisies to pop off the page so I used a BG10 Copic marker to outline the white flowers. No blending, just outline the flowers. The color will fade a little as it dries. See how the daisies really pop off the paper and come to life? Next up, it's time to assemble my card. 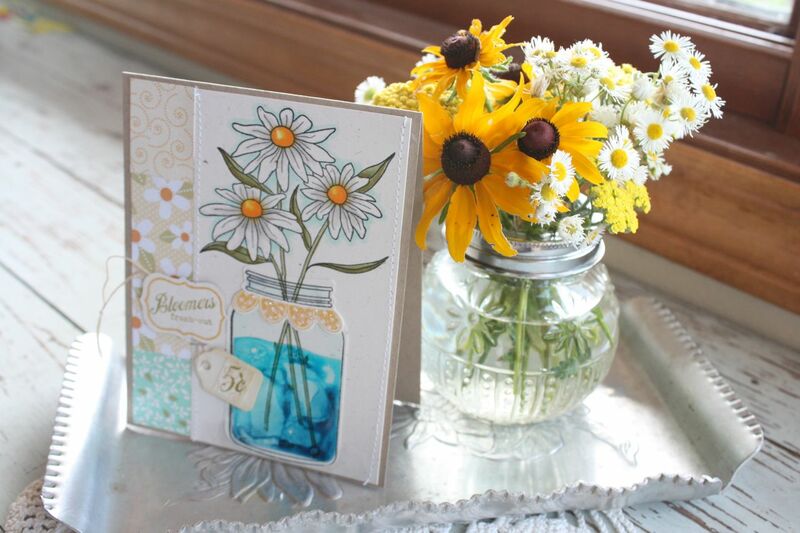 The jar image with the flowers takes up the good part of an A2 size card. I chose three Papertrey patterned papers to use on the side of my card. They're cut 1" wide. 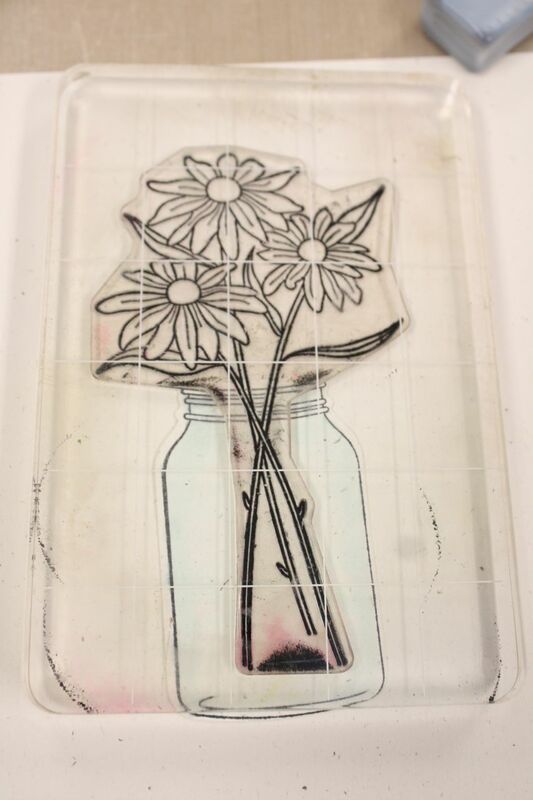 I also adhered the clear cardstock piece to my flower colored piece using Hermafix adhesive. I chose a strategic spot that will be covered up with a tag. I also put a little under the darkest blue and it didn't show up. I added some machine stitching to the main image and then finished up my card using the Friendship Jar label stamp, dies and sentiments. 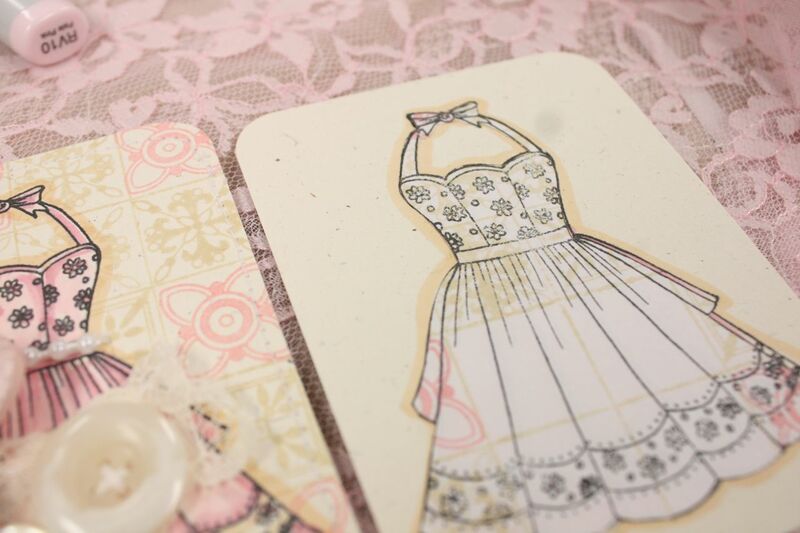 The Tiny Tag is from my Etsy shop and was adhered with a pop dot and a Tim Holtz tiny staple. Here's my beautiful finished card. Complete with pretty, colored flowers...a glitter jar topper, fun sentiments and the swirly water on the jar. The shiny-ness of the clear cardstock is amazing in person! And it wouldn't be complete without some fresh picked bloomers straight from the field near our house. Just the tiniest bouquet of fresh cut flowers can brighten the day. 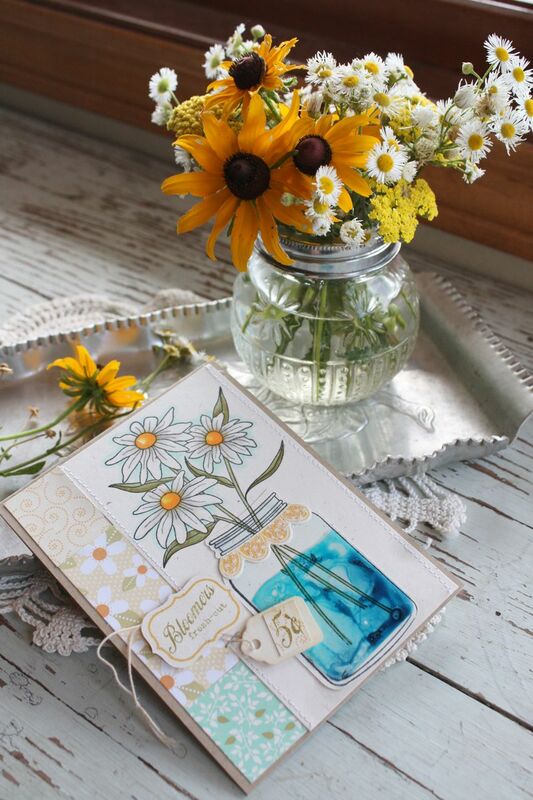 Such a pretty little centerpiece...or a very thoughtful and one of a kind gift. Tip: Try using yellow or pink ink refills to resemble fresh lemonade. How about a little red ink around the outside and then color the marbles to resemble eyeballs for Halloween. 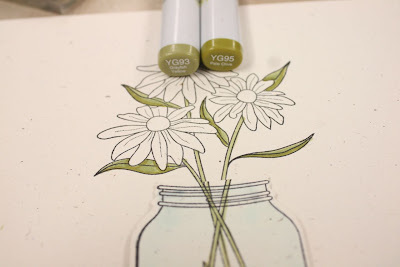 Use shades of green for my favorite margaritas or a jar of pickles. 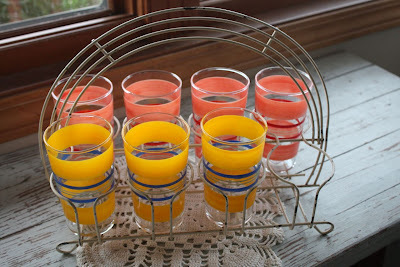 Or orange for fresh squeezed orange juice. Lots and lots of fun ideas to try. Friends are the joy of life card..